Mini Tutorials for Studio Calico January Kits! 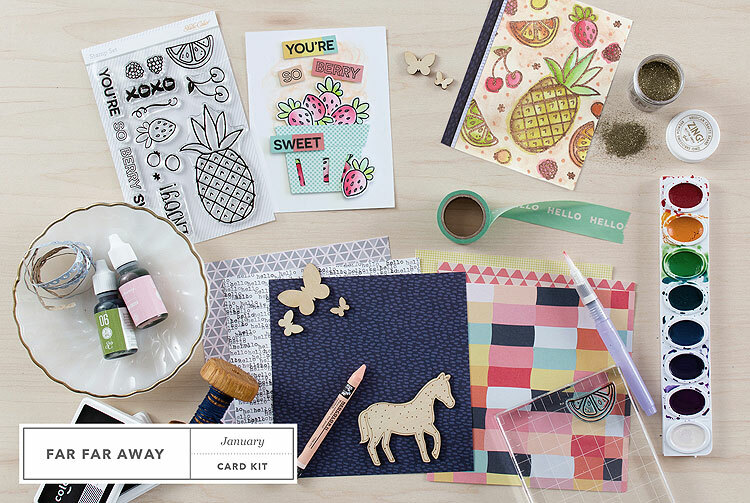 So, here’s the official sneak peek photo of the Far Far Away card kit from the Studio Calico website. 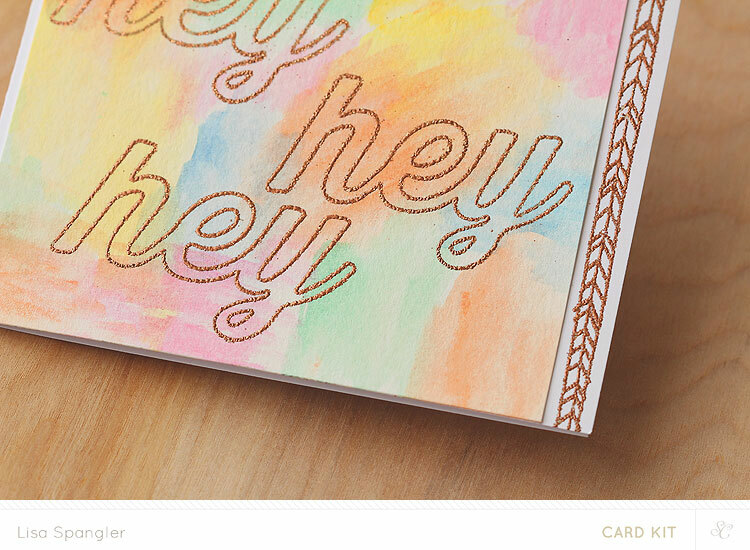 BTW, I just love the new sneak peek format — just makes me want to get crafty. Anyhow, I did not take this photo, but see those two cards up there? They are mine! Blushing at how good the photographer made them look. I made a background by lightly scribbling the neocolor crayon on a white card base and then going over it with a waterbrush to blend it out. 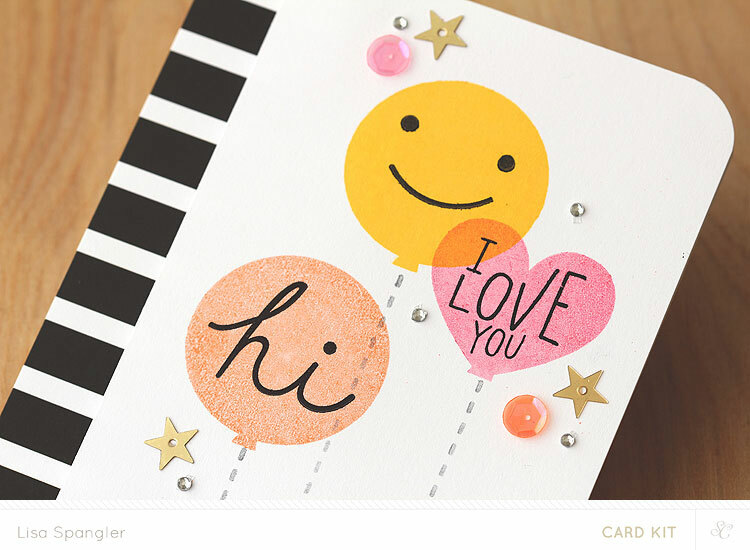 You could use a regular paintbrush too — just try not to get too much water on the card so that it doesn’t warp. 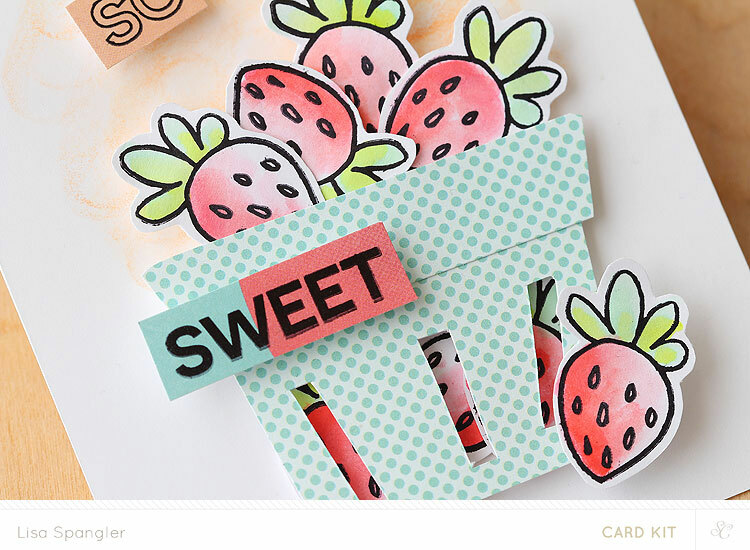 Next I stamped a bunch of strawberries on white cardstock, then colored them and cut them out. I colored them using my Color Theory inks — just swipe the ink pad on the inside of the lid to make a palette, then pick up color with a waterbrush and color away! I used well red, blush crush, mint hint, and lime light. Love doing this little trick because you get so much more from your stamps! I cut the berry basket freehand from some of the paper that comes in the kit. Let me know if you’d be interested in a cut file and I’ll try to put one together for ya! To finish up the card, I stamped the message on some scraps and then cut it up, then put everything together. Here’s a closeup of the basket so you can see it better. I just love how this turned out! 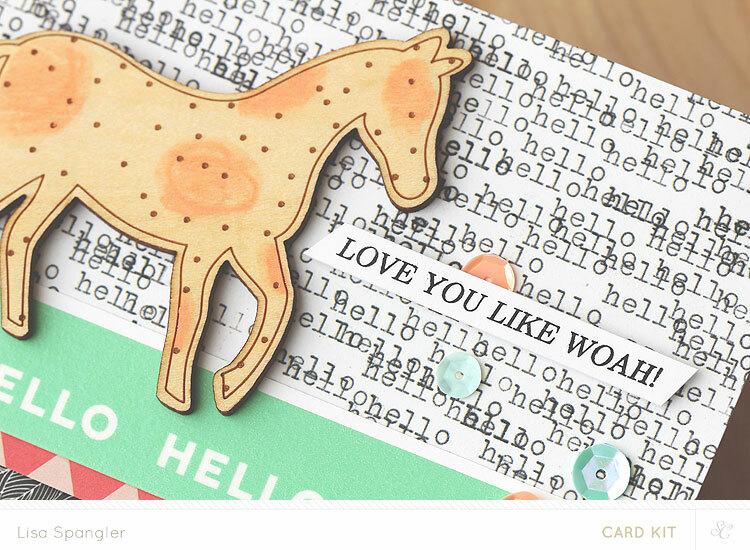 And I gotta say I this whole card was totally inspired by that aqua polka dot paper. Would you believe I thought of making the basket first thing? After I finished the background for this card I just couldn’t bear to cover any of it up with a message — so I decided to leave it blank! I can always add a message later or just use it as-is. 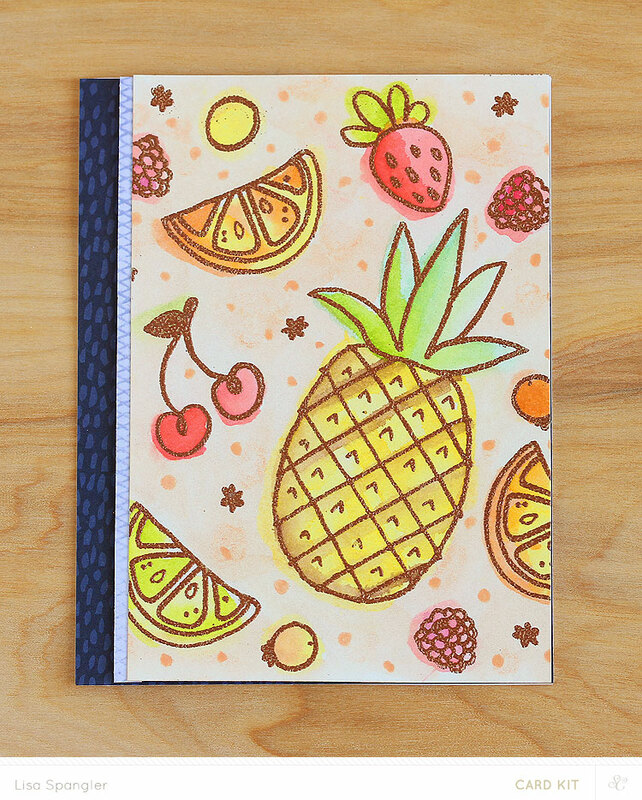 Once I had all the fruit stamped and embossed I watercolored it using Color Theory inks. Yep, I can’t stop doing that either. I decided to make it kinda messy — who wants to stay in the lines anyway? Then I scribbled the neocolor crayon lightly all over and went over it with a waterbrush to blend it. Once the background was dry I used the crayon to make some polka dots. Finally, I layered it to some papers in the kit and then a card front. Oh and that navy paper on the left side? Yeah I’m hoarding it. I just used a little strip here so that I could make it last as long as possible. This one is super easy so I won’t go into to much detail. But, see those spots on the horse? Well, I made them with the neocolor crayon. Told ya, just can’t stop using it. And one little tip — the washi tape that comes in the kit rocks — love the mint color! Just be sure to watch where your tape begins and ends or you might end up saying HELL instead of HELLO. Can’t have that. Well unless ya want to :) Also, I backed my tape with white cardstock so that it would really pop against the background. Oh and see the sequins? I tucked some of them underneath raised bits of paper for a little added dimension. Love doing that. Okay, let’s walk through these cards! 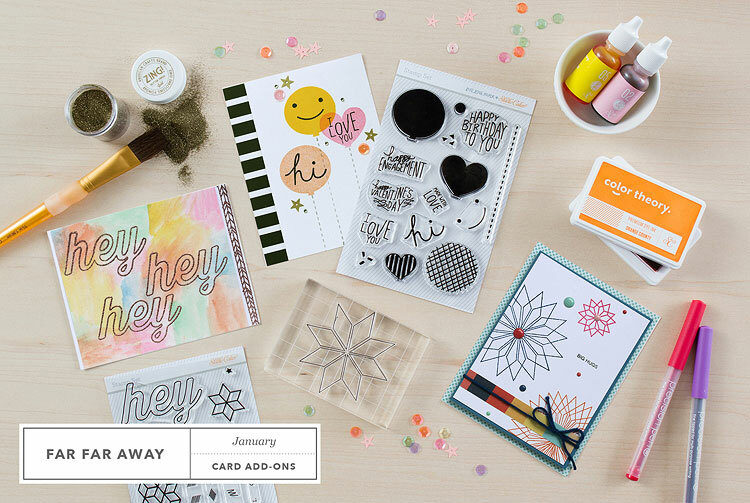 I’m always saying “hey” or “hey hey” so this stamp Cube set is right up my alley! 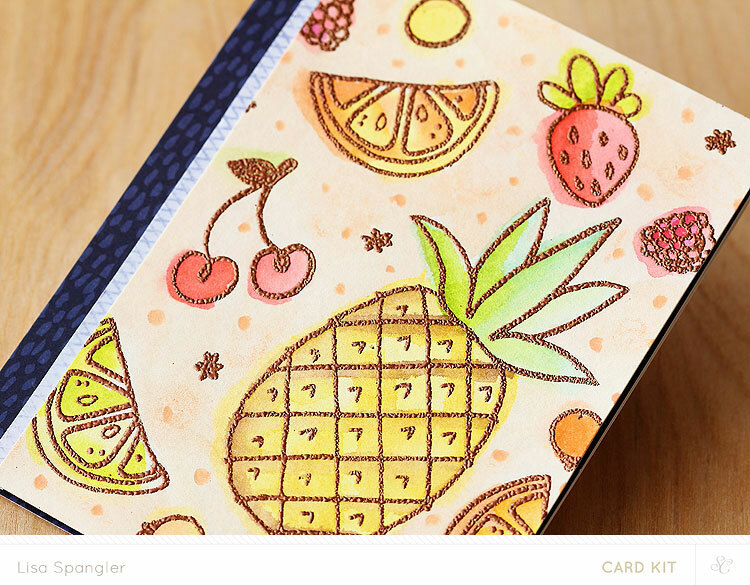 Bet you can guess what two things I’ve mentioned before that I used on this :) Yep, that neocolor crayon again and zing copper metallic embossing powder. First I grabbed a piece of watercolor paper and scribbled blotches here and there with the neocolor crayon from the main card kit. Then I went over them with a waterbrush. Next, I added more colors by scribbling on blotches from the Mister Huey’s watercolor set. 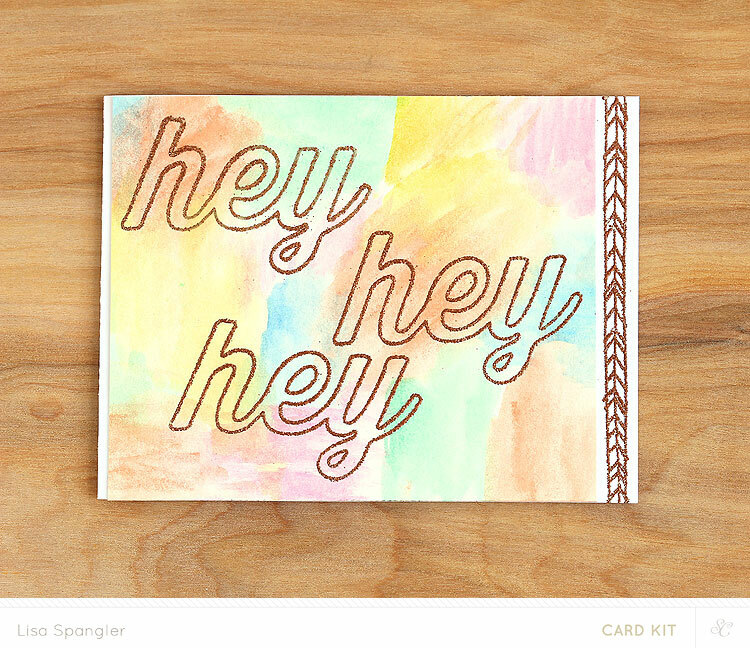 Once it was completely dry I stamped and heat embossed the hey hey hey. If you’re impatient like me, you can zap the paper with your heat gun to get it to dry faster. Just make sure it’s all dry before you try the embossing or it will stick everywhere. Trust me. I’ve said it before and I’ll say it again — Tina is a genius. 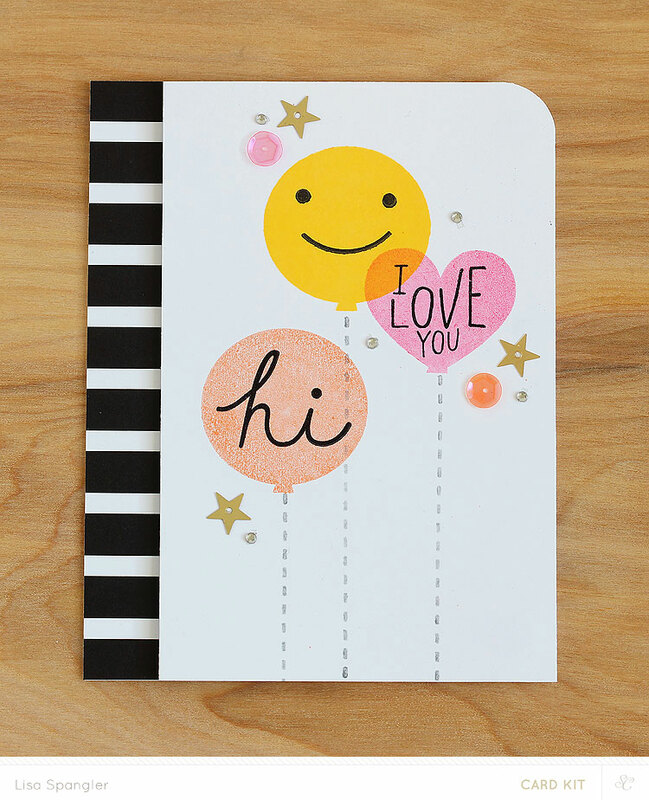 She designed this Balloons stamp set and I think it’s just too clever. Just like she is. 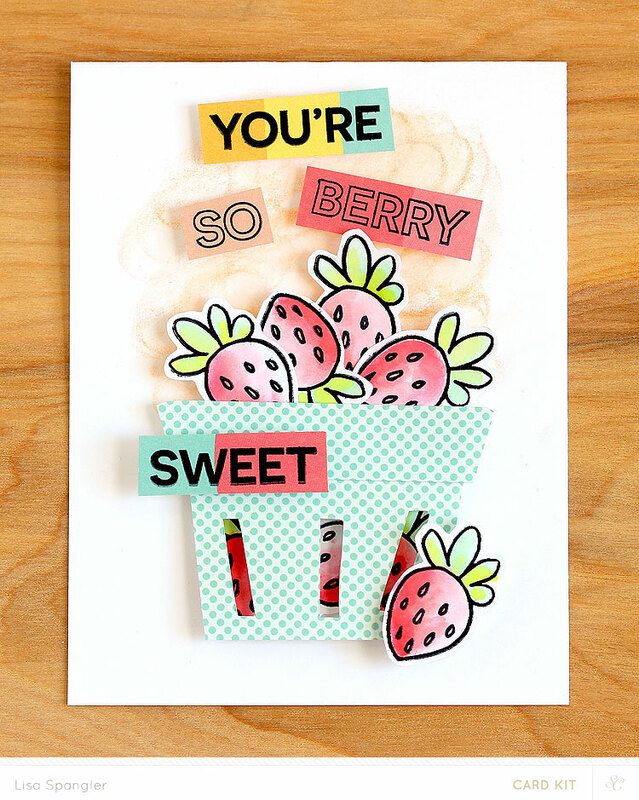 It’s so ridiculously easy to make cute cards with this set that it almost doesn’t need an explanation. But here goes. Stamp the balloons first and then the insides after. Here’s a little tip — if you overlap Color Theory inks they will blend to make new colors — like how the sunny day and the flamingo overlapped to make a cool orange here. Just be sure to pick colors that will look good together. Oh and that b+w paper is from this dots and strips paper pad. Can’t believe it hasn’t sold out. Now for one last card. So, this card all came together after I tested the Diamonds stamps on scratch paper. You can see the original design up there in the official sneak photo. It looks kinda like a quilt. Well, after I stamped it I had an “aha” moment — it reminded me of a spirograph. And the rest is history. This card is really really really super easy. But so cool right? 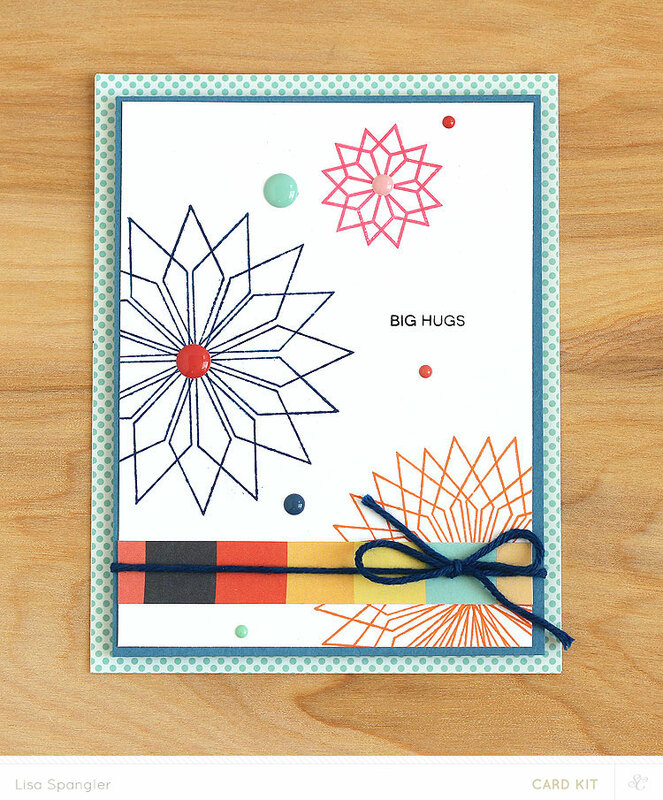 I stamped the little spirograph with flamingo, the middle one with deja blue, and the last one with orange county. Just stamp once, then rotate and stamp again. For the orange one I stamped it 3 times. The twine + the papers are from the main card kit. Really loving all the navy this month. Here are the supplies! Note that if you’re not a subscriber you won’t be able to use some of them until the big reveal at midnight EST today. super chock full of fun and inspiration ! ~amy~ recently posted..walking on sunshine. Best wishes for a wonderful 2015! 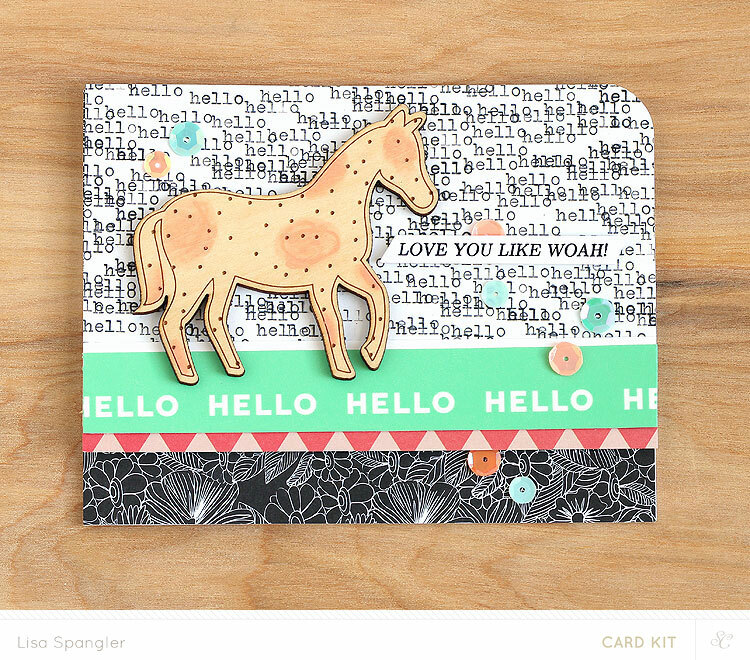 Pingback: Studio Calico January Kits! Alice Wertz recently posted..Happy Christmas! You reallyyyyyy make me want to buy this kit!! Beautiful cards, Lisa!